St. George Island (SGI) is a stunningly beautiful 22-mile long barrier island just off the coast of Franklin County, one of Florida's most rural counties. SGI is home to miles of gorgeous, white-sand beaches, beautiful luxury beach houses, and the St. George Island State Park. Connecting the mainland of Florida with St. George Island is a 4-mile long bridge. Winds can swirl in from any direction at any time. High-profile vehicles can and have been caught off guard and have even tipped over causing expensive, time-consuming bridge closures. In August 2016, WeatherSTEM was approached by Franklin County Emergency Management (FCEM) who had heard great things about our program from some other Florida counties. At the time, there were only a few operational weather stations in Franklin County, including our WeatherSTEM units at the Florida State University Coastal and Marine Laboratory and the Franklin County School. 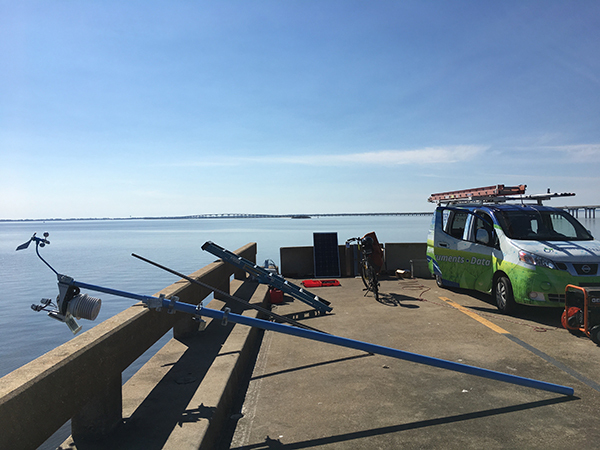 There were no operational weather stations near the SGI Bridge and the team from FCEM wanted us to do something about that. In a partnership between FCEM and WeatherSTEM, we agreed to install a solar-powered, cellular WeatherSTEM unit at the SGI Bridge. 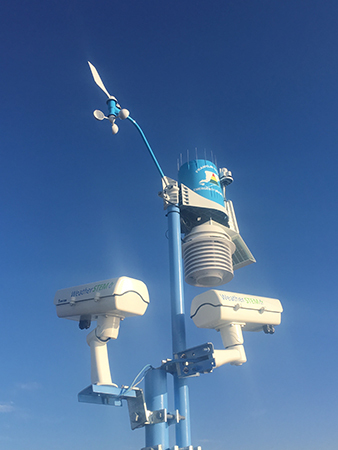 At the time, our WeatherSTEM units required electricity and an Internet connection, however, there was no Internet or power available to us at the site of the installation. The WeatherSTEM team went to work and sought leadership from top pioneers in the weather instrument, solar panel, battery, and cellular communications industries. We emerged with a specification for a 100% solar-powered, cellular WeatherSTEM system with one of our full weather stations, two high resolution cameras, and a water temperature monitoring station. The system is powered by a 200W solar panel that continuously charges a battery array the WeatherSTEM unit draws power from. The system is connected to the Internet via a Verizon cellular router. WeatherSTEM technicians can log into it remotely to manage the system and even reboot its individual components. 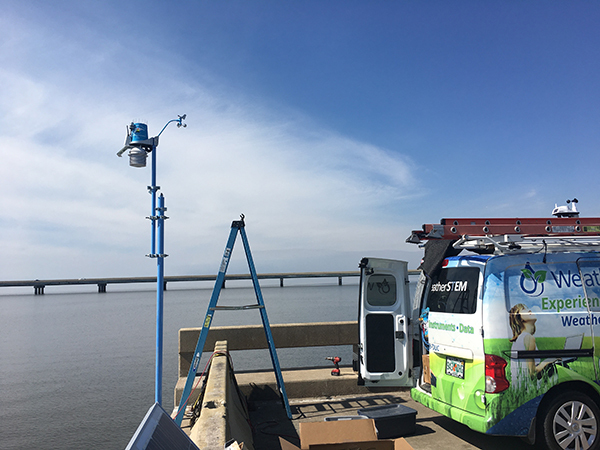 During Huricane Irma in September 2017, the power and Internet were out across most of the Florida panhandle, yet throughout the entirety of the storm, the SGI Bridge WeatherSTEM unit reliably transmitted data. In May 2018, Tropical Storm Alberto moved ashore just west of Franklin County. Numerous power and Internet outages impacted the entire region and in fact mandatory evacuations were issued for SGI. 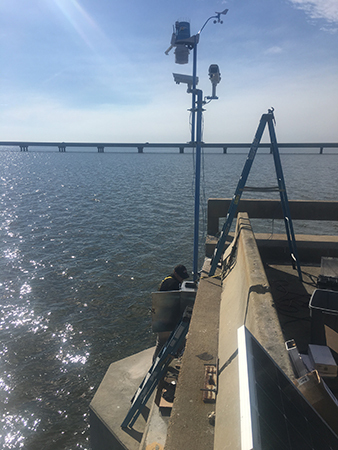 The SGI Bridge WeatherSTEM unit with its independence from any ground-based Internet or electricity provided a critical data point to FCEM to determine when it was safe to re-open the bridge. Numerous public entities including the National Weather Service as well as many news organizations including WCTV of Tallahassee broadcasted data and images from the SGI Bridge WeatherSTEM unit to the public. 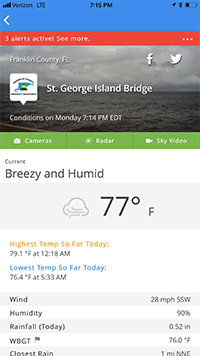 The SGI Bridge WeatherSTEM unit uploads to its own website online at http://franklin.weatherstem.com/sgibridge and also has its own channel on the WeatherSTEM mobile app for iOS and Android. 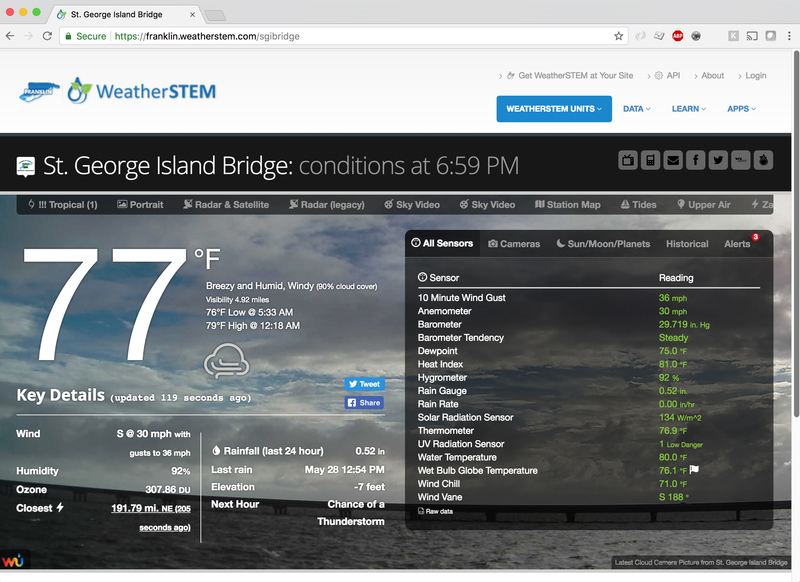 In addition, the SGI Bridge WeatherSTEM unit has its own Facebook page and Twitter feed automatically updated by the system with forecasts, alerts, and even useful education and safety information. Beautiful sunrise and sunset pictures are even auto-posted each morning and evening helping remind people from far and wide of the stunning natural beauty of this part of Florida known as the Forgotten Coast. We hope to install many more cellular, solar-powered systems such as the one on the SGI Bridge across Florida and beyond. Our next such system will be installed in the near future in partnership with Walton County (FL) Emergency Management on the Route 331 Bridge to Destin. Looking ahead, we hope to see a day when all our WeatherSTEM units will be 100% solar-powered and cellular so they'll continue to operate and provide critical, live-saving information even in the event of a complete power and/or Internet outage. Contact us today at info@weatherstem.com or call us at (850) 297-1800 to bring WeatherSTEM to your organization - or bridge!